This is a kids film that adults will love. It is full on, with great traditions, a great baddie, it is loud and it is scary, The Kid Who Would Be King is so much fun! Set in suburbia where the world around normal life is under threat. We see newspaper headlines of all that’s going wrong. Maybe this is seen from the child’s perspective but surely the way we all feel most of the time anyway?! The kid is Alex. He’s having a hard time at school and it’s not great for him at home either, but with his best friend Bedders they get on with life. The CGI is spectacular and as the boys learn about what they need to do to save mankind (!) horses, monsters, fire, car chases with no adults to interfere makes for a visual spectacle. The movie is accompanied by a dramatic, orchestral soundtrack provided by a wonderful ensemble including Damon Albarn amongst others. We are carried along with the boys as they learn what they need to do to defeat the dreaded Morgana and become stronger and wiser along the way. We also meet the great Merlin who is a fabulous character and brings lots of laughs. Angus Imrie feels like a face we’ll see again as he really occupies the screen and is physically impressive. With the older form of Merlin played by Patrick Stewart, you are spoilt when the character appears no matter what guise. 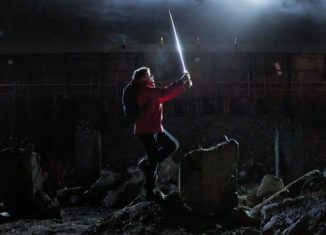 Director Joe Cornish produces another film evocative to plenty of classic movies, much like he did with his debut Attack the Block. The Goonies, Bedknobs & Broomsticks and even Back to the Future will come flooding back as we watch, the momentum continues and it’s a really exciting cinematic experience. The baddie is just about bad enough for a fantasy PG certificate too. Rebecca Ferguson’s Morgana is pretty scary and looks amazing in every form through the film, if your kids loved The Greatest Showman they might not even recognise the Never Enough singer. Leading up to a massive battle scene at the time of an eclipse the build up is tense, Cornballs (as a member of Black Squadron I can call him this) keeps everyone happy with drama, friendship and a fabulous moral. But our favourite bit was still the appearance of Adam Buxton – it just wouldn’t feel right if he didn’t make a cameo would it?